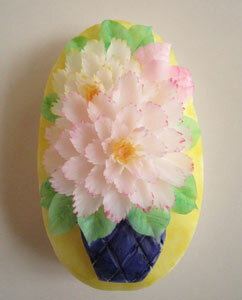 You Can Be Carving Beautiful Smooth and Jagged Petaled Melon Flowers Very Soon. Once you learn the carving melon flowers secrets taught in these lessons, you will amaze your friends and family when you carve YOUR fabulous melons. This set of lessons was created to pick up where the Vegetable and Fruit Carving 101 Course and Carving Watermelons – Roses, Buds and Leaves leave off. 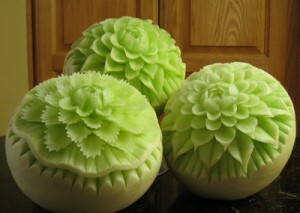 It is for people who want to learn more secrets for carving melon flowers. You will find it easy to follow these step-by-step instructions teaching Thai style melon carving techniques. It’s actually two complete lessons about fruit and vegetable carving in one DVD. You will learn, step-by-step exactly how to carve several petal designs as well as ruffled and scalloped edged finishing designs. Once you master the smooth petal designs in the first lesson, you will be ready to learn how to carve the more intricate looking jagged edged petals shown in the second lesson contained on this DVD. 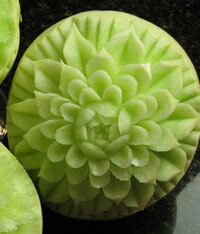 Once you know how, you can mix and match these petals to create your own carving designs on any type of melon. Watermelons can be particularly beautiful. These flower designs are also great for carving other types of fruits and veggies including mangoes, papayas, turnips, daikon and yams. 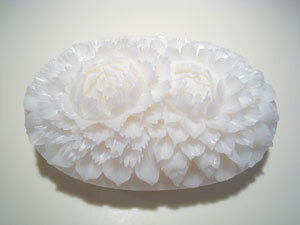 These flowers are beautiful to carve on soap, too. Learn the right way to carving Melon Flowers. Don’t let the complexity of the look of carving melon flowers fool you. It is not as difficult to carve these as you may think, , when you are shown exactly how to carve them. Perfect for Intermediate Carvers who want to expand and refine their techniques yet easy enough for a beginner to follow. You’ll be carving Melon Flowers in no time! This video is designed to continue to teach where the “11 Week Vegetable and Fruit Carving 101 Course for Beginners” leaves off. The “Carving Melon Flowers – Smooth and Jagged Edged Petals” lessons are perfect for those who have some melon carving experience and want to refine and expand their skill and carving repertoire. Carving Melon Flowers have never been any easier! To learn some of the basics first, “Carving Watermelons” is a melon carving primer taught in the 11th week of the course. You’ll be carving melon flowers just like a professional. You will learn the same way. This “Carving Melon Flowers” video is like watching over my shoulder. It’s like having me right there in hte kitchen with you. In this video you will get real time instructions and advice on clear high quality video. I’ll show you common mistakes and how to avoid them. You learn on your own time schedule at your own convenience. Carving Melon Flowers have never been easier. What is great about the lessons on video compared to a live teacher, is that you can go back at any time in the future and the video again. Even years from now, if you’ve forgotten, you can always relearn by watching the video again. 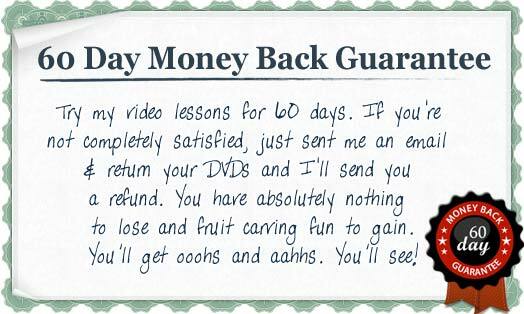 This is actually two full carving melon lessons on one DVD with 1 hour and 41 minutes of instruction. The first lesson will show you step-by-step exactly how to carve several types of smooth petals and a scalloped finished edge. Then you will be ready to advance to the next level. The second video will take what you learn in the first lesson and expand upon your new skill. You will learn how to carve intricate zig-zagged edge petals and how to finish your carving with a ruffled and scalloped edge. 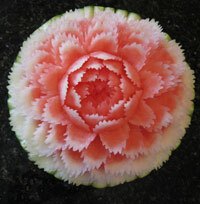 Carving Melon Flowers have never looked so beautiful. The DVD has numerous chapters so that it is easy to go back and watch the segments that you want to study again. The chapters also make it easy to skip to the next section when you master a melon carving technique right away. 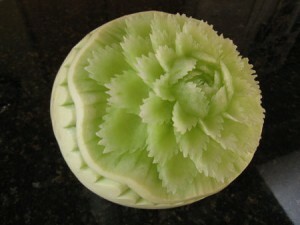 Carving melon flowers is not difficult to do once you know how. After watching and carving along with the this video, you will be carving melon and other fruits with these impressive and beautiful flower patterns. Your friends will be amazed! You will even impress yourself! Carving Melon Flowers have never been so easy! P. S. You will need a good quality, sharp melon carving knife for this lesson. I highly recommend the Thai Pro Flexible blade knife especially for carving melon with the jagged edged flower petals. With these DVD’s, you will be enjoying the creative satisfaction of Carving Melon Flowers that will even impress yourself.